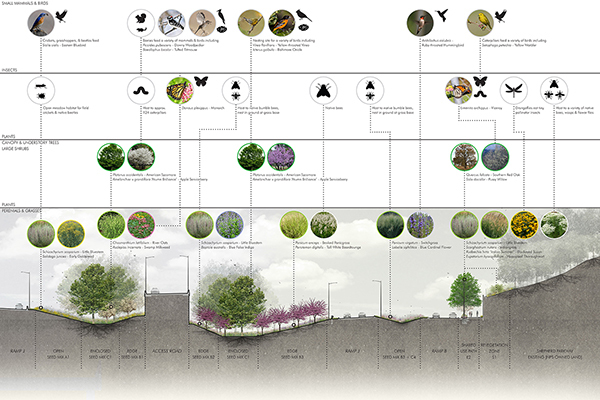 The Access Road Ecotones Project recently won the Virginia ASLA Presidential Award of Excellence for Analysis and Planning, the most prestigious award bestowed in that category. LAB is dedicated to environmental stewardship as a critical component of our holistic approach to the design of places that improve the lives of local communities. We are especially excited to leverage the research associated with project as we move forward on a broad range of urban projects. LAB also published a research paper and presented this research at the International Conference of Ecology and Transportation. The Access Road Ecotones project broke ground in 2018!